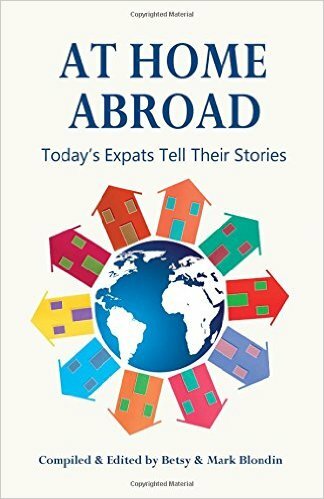 Last week I posted an interview with Betsy and Mark Blondin, author/editors of At Home Abroad: Today’s Expats Tell Their Stories. This week, they share with you some excerpts from their book. …We’d landed in Cambodia with backgrounds in writing, marketing, and business management and soon discovered we were pretty valuable commodities. Work opportunities started coming to us unexpectedly even though we weren’t looking for them, and they all opened doors to new circles of friends, new ways of life and new ways of fitting in in this foreign country which quickly became our home. The cost of living is extremely low in Cambodia, so our lifestyle included dinners out most nights of the week and plenty of trips for weekends or longer to other parts of the country and Southeast Asia. But the best parts of living in Cambodia were the people and the simplified way of life. Gone were the stresses of monthly bills (everything is cash) and traffic jams (we got around by tuk-tuk and nowhere was farther than 20 minutes). In their place were gentler, kinder attitudes, open-minded tolerance and acceptance. And, after originally landing in a country I first found to be uncomfortable and strange, Skip and I came to crave — and cherish — the strangeness. While we missed family and friends, we made trips back home, both to the US and England, and used Skype, Facebook and email to keep in touch. We regularly wrote on our blog (www.TheMeanderthals.com) and had several visitors from home who came to join us on our adventures. We maintained a US address at Skip’s sister’s home so we could continue to have a foothold in the States (and a mailing address and address for credit cards) and limited our purchasing of anything that we didn’t consider essential (it took almost four months before we bought a toaster as we felt it would tie us down!). After living in Cambodia three years, we decided to pull up anchor once again so we could find magic in other parts of the world. We spent four months travelling in Asia — a month in India, a month in China, three weeks in Vietnam and three weeks in Thailand (an unplanned excursion due to Skip landing malaria and having to be hospitalised and recuperate in seaside resorts) — then started house sitting (through www.TrustedHouseSitters.com and www.MindMyHouse.com). Since December 2013, we’ve “lived” in England (twice), France (twice), Cyprus, Italy, Portugal, Nicaragua, and Greece. We’ve taken care of prize-winning Persian cats in Oroklini, had a houseful of rescue animals in Comigne, become best friends with a woolly Golden Retriever in Lewes and hung out with a feral cat in Gialova. It’s a wonderful lifestyle and one we’ve now become quite addicted to. …And so my day begins, breath by breath, step by step. By step…By car trip…By plane trip…By new apartment…By new job. Now I find myself in Taiwan, holding the wisps of a green memory in my hands. I could say it was time to move on. I could say I was ready to re-tackle the outside world. I could own up to the wanderlust that defines many expats. But who really knows? Stillness is here, in Taipei, much as it is in the pine groves of New Zealand. I will return and I will go, but home is wherever I can find a moment to be still and ask “Why?” Finding one’s place anywhere and nowhere is a double-edged sword in a world seemingly content with stone niches. I have my backpack. And the breath. And so a new day begins, breath by breath, step by step. My name is Barbara Galewska, I am a Polish woman 31 years old, and I am an expat in Argentina. I think it all started when I was 13 years old and my parents decided to move to a different city. I had to change schools, friends, and routines. I was out of the context I was used to and lost the natural confidence I always had but took for granted. I considered the new place a nightmare, I had no friends, I was bullied at school, I felt lonely like a stranger, like I did not belong, and I hid inside my shell. I began to read hundreds of books, from nonfiction, philosophy, and literature to travel books. I was overwhelmed with my own private world and I had a plan for life — to escape from all that was around me. I knew the only way I could make it was to study hard, get enrolled in a good university, and be financially and life independent. …Then came the moment to start sharing this happiness and my passion for life. I had a new dream and it was as strong as this dream from 17 years ago. I dreamed about love. About a true, strong connection based on loving, caring, and respecting each other. And here I am, sitting on a couch in Rosario, Argentina, eight months pregnant, married to the love of my life, feeling calm, safe, loving, and loved. I am a Polish expat in Argentina. I don’t know if Argentina is my destination but I know that this term of being an expat is definitely it; and this makes me feel there is nothing like a place I belong to but a state of my mind’s freedom. I am here in my very own context, smiling to a small baby from my future and to all my adventures and experiences from the past. I am sitting on this couch, feeling my baby move inside me, thinking about all the choices I had to make and situations I had to live through to end up here. A Polish girl who had a dream. At Home Abroad is available through Amazon as a paperback or eBook. To contact Mark and Betsy, send an email to blondins@todaysexpats.com. Visit the At Home Abroad website todaysexpats.com and click on “expat resources” for a listing of helpful expat websites! Now, enjoy some more of the Blondins’ photos! This entry was posted in Book review, Guest writer. Bookmark the permalink.